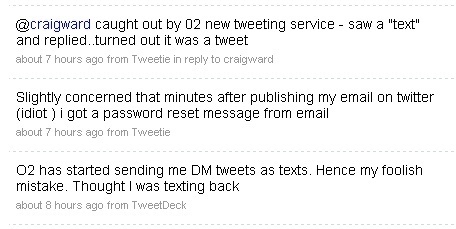 BBC Technology Correspondent Rory Cellan-Jones has, in his own words, been 'caught out by 02 new tweeting service'. He received a text message this afternoon and texted back with his email address (for whatever reason), not realising that O2 would kindly broadcast that to all his Twitter followers. Fortunately Cellan-Jones realised his error immediately and the tweet was live for less than a minute before being trashed. Sometimes even people at (or reporting, or trialling) the cutting edge of technology can get caught out. With online privacy such a hot topic at present, technology suppliers need to be careful how they present their services so that mere mortals don't suffer the same fate in their millions. By the way, if you are an O2 customer you can read their press release, O2 Signs Deal with Twitter to Offer Text Alerts, from 13 July 2009.